Designed by Chrissy Howard of Jinx McDonald Interior Design (JMID), the new space personifies the Naples lifestyle, seamlessly marrying the elegance and grace of interior touches with the sights, sounds and feel of nature’s landscape. 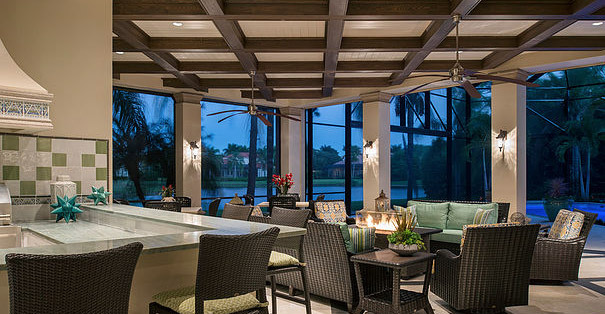 The impressive stained wood beams mirrored by the rich texture of the rich stone floors offers effortless elegance in an opulent outdoor environment. Harwick’s masterful use of materials, art and elegance are apparent throughout. The formal private estate offers 5,397 square feet under air and a very spacious luxury outdoor living space, eloquently showcasing the estate’s natural surroundings and complimented by the expansive panoramic, picture screen enclosure. The home’s master kitchen was transformed from a perfectly functional workspace to a culinary masterpiece, befitting a world-class chef. Where the residents previously spent only three to four months a year at the residence, they have now made the transition to a more full time status; therefore, they were very involved during the renovation process. This exquisite renovation also maximized the home’s generous pool and spa, outside gourmet kitchen with granite bar, two perfectly appointed sitting areas for entertaining and a feature fireplace wall comprised of cascading stone. The estate’s well-appointed .72 private acres has been impeccably manicured and designed with the simple elegance and sophistication representative of a Grey Oaks lifestyle. The estate exemplifies Harwick Homes’ signature attention to detail inside and out.